What strange mysteries will Voyager 1 encounter now that it has left the solar system? Scientists from the University of Maryland (UM) have reignited the controversy about whether the Voyager 1 space probe, which has been traveling away from Earth since its launch in 1977, has left our solar system and entered interstellar space. Their new study, published this week in The Astrophysical Journal Letters, argues that the spacecraft departed the solar system more than a year ago on July 27, 2012. The dauntless Voyager 1 spacecraft currently is traversing a little-known region of space some 11 billion miles (18 billion kilometers) away from its home planet. The results of the UM study run counter to recent papers published by NASA scientists finding that Voyager 1 has only made it as far as the edge of the heliosphere–that region of space surrounding the Sun that teems with charged particles and is dominated by the solar magnetic field. What makes definitively locating Voyager’s position so difficult is that scientists are unsure about just where the boundary between the heliosphere and deep space lies and what it looks like or how it behaves. Most theorize that they will know when the space probe has passed through this mysterous heliopause transition zone when it registers a sharp reduction in solar particles, an increase in galactic particles, and a shift in the prevailing local magnetic field. According to lead study author and UM astrophysics researcher Marc Swisdak and his colleagues, NASA’s conclusions are flawed because they place too much importance on differences detected in the magnetic field as Voyager 1 leaves the region of the Sun’s influence. 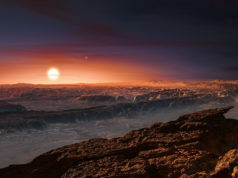 Rather, a more reliable indicator is when solar particles permanently disappear and only galactic particles remain–and that, the UM study says, occurred at a precise moment in July of last year. 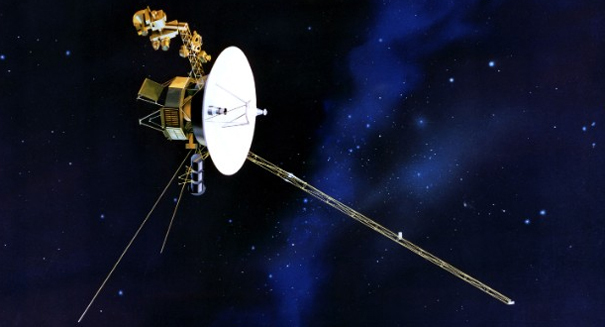 Swisdak’s team argues that although one might expect to see a change in the magnetic field once Voyager 1 is outside the solar system, the reason the probe has so far failed to detect a shift is due to a phenomenon known as magnetic reconnection. Reconnection occurs when magnetic fields come together, break apart, and then reconnect in new positions, the study explains. After performing complex computer simulations, the researchers concluded that the Sun’s magnetic field and the magnetic fields of galactic space have joined on a fine scale in what they call “magnetic islands” and, because they run in the same direction, Voyager never registered a shift. In a written response to the UM study, NASA said yesterday (Aug. 15) that it will evaluate the magnetic connection model and try to reconcile the UM team’s findings with Voyager’s data.